Available now from Amazon! Only 99 cents! If you want this in print, all of the stories except “Gave Up The Ghost” appear in the print edition of EVERYTHING HAS TEETH. You’ve read DEAD CLOWN BARBECUE and now you want more, more, more! 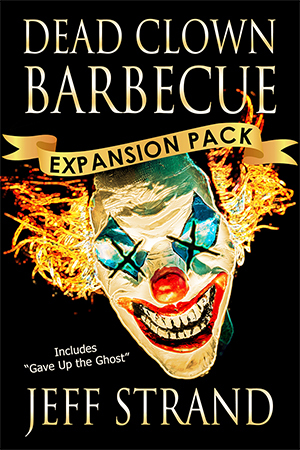 Well, sometimes in this dark, cruel world we actually get what we want, because here’s DEAD CLOWN BARBECUE: EXPANSION PACK, another eight similarly deranged stories for your reading ecstasy. “The Car.” A pair of vampires get together for an evening of vicious fun. “The Loneliest Jackalope.” Bunnies with antlers! You can’t go wrong with bunnies with antlers. “A Bit of Christmas Mayhem.” Andrew Mayhem vs. a trio of axe-wielding Santa Clauses. “Scrumptious Bone Bread.” It’s not just for giants anymore. “A Flawed Fantasy.” Sometimes, two girls at once isn’t the best idea. “Tin Cans.” What will you hear when you put one to your ear? Amazon link for this seems dead. Can I buy the exp pack elsewhere?